During Sen. Kamala D. Harris’ 25-year career in law enforcement, she has established herself as a formidable presence in the courtroom, on the campaign trail and ultimately in government. She grew up watching her African American dad and Indian American mother protest for civil rights in Berkeley and took that fierce fight for justice with her to law school. She served two terms as San Francisco’s first female district attorney and was the first woman elected as California’s attorney general. While such attributes are often rewarded in Washington, they’re not going over so well for Harris – at least with some male colleagues and cable commentators. 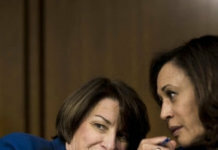 As a member of the Senate Intelligence Committee responsible for investigating Russian interference with the 2016 election and connections between the country and Trump campaign officials, Harris has landed a star role in the country’s political drama. At that moment, Sen. John McCain, R-Ariz., cut in and appealed to the committee chairman, Sen. Richard Burr, R-N.C. The scene was nearly identical to one that played out during a hearing last week, when Harris was questioning Rosenstein.